Raymond Jean 'Ray' Bourque (born December 28, 1960) is a former Canadian professional ice hockey player. 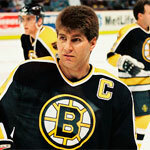 After a stellar junior career with Sorel and Verdun of the QMJHL, in which he was named the league's best defenseman in 1978 and 1979, Ray Bourque NHL debut came in 1979 after being drafted 8th overall by the Bruins.Ray Bourque asserted himself from the start as one of the best defensemen in the league, winning both the Calder Trophy as Rookie of the Year and a First Team All-Star selection, the first time in NHL history a non-goaltender had ever achieved the distinction. His 65 points that season was a record at the time for a rookie defenseman. Ray Bourque currently holds records for most goals, assists and points by a defenseman in the National Hockey League (NHL). Bourque has become near-synonymous with the Boston Bruins franchise, for which he played 21 seasons and became its longest-serving captain. He finished off his career with the Colorado Avalanche where he won the Stanley Cup in his last NHL game. Bourque was inducted into the Hockey Hall of Fame in 2004, the first season he was eligible. His uniform number #77 has been retired by both the Bruins and the Avalanche; he is one of only six players whose jersey has been retired by more than one club. His birthplace of Saint-Laurent named the Aréna Raymond-Bourque in his honour.